The state of Missouri has been home to several great athletes over the years. Coming through the ranks have been olympians Matt Tegenkamp, Colleen Quigley, and Courtney Frerichs, among others. They have produced several of NCAA Division I's top athletes including KC Lightfoot, Chris Nilsen, and Taylor Werner, among others. What Missouri has never produced, though, even after listing off those names above, is a New Balance Indoor National Champion. Lightfoot and Nilsen both won outdoor championships, but never indoor. On Sunday, Hazelwood West's Justin Robinson changed all that. After a breakout sophomore campaign last spring, Robinson kicked off his indoor campaign at the Arkansas High School Invitational with a US No. 1 46.77 in the 400 meter dash. He followed that up with three more sub-48 second quarters and a US No. 6 21.18 200 meter dash. 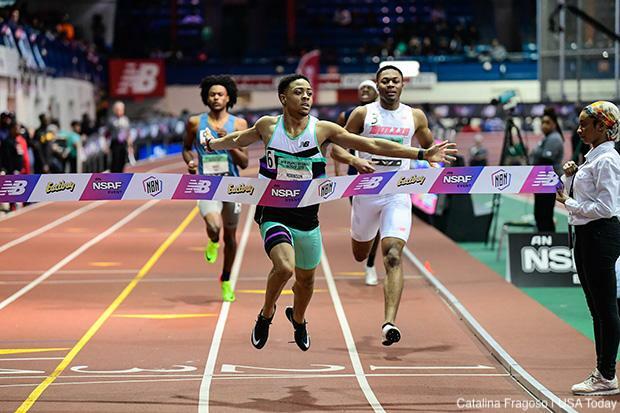 The heavy favorite heading into Sunday, Robinson put any doubts that anyone may have about his ability to rest as he blazed around the Armory track to the tune of a new indoor personal and still US No. 1 46.55. Robinson's mark is the seventh fastest time in US high school history, leap-frogging the legendary Rai Benjamin in the process. It was not a lifetime personal best for Robinson. That came at the USATF Junior Outdoor Championships when he took fourth in 46.20. Beyond that, he also split a mind-boggling 44.7 on the U20 4x400 at the IAAF U20 World Championships. Robinson is hardly finished excelling as his indoor season has shown. Look for him to challenge the 45s this spring and continue to grace the national headlines.